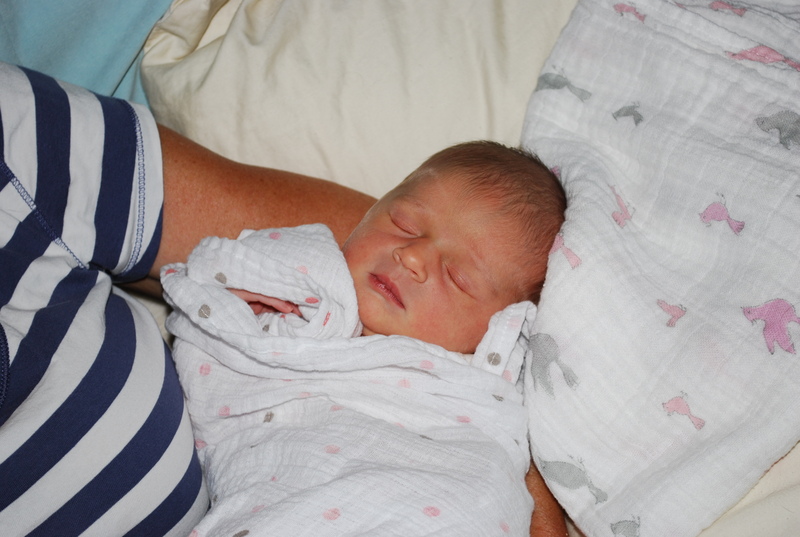 It has been two weeks already since I gave birth to my baby girl Eloise. What a magical two weeks it has been. It’s as if this little girl has been with us forever. My husband and I can not imagine our lives with out her. I have always wanted to make my own clothes, especially for my own children. So now that I am days away from having my own baby girl, I have been a little more eager to begin sewing for her. Being the very novice sewer that I am I set out to find the easiest pattern for a little girls dress I could. And I came across this free pattern. 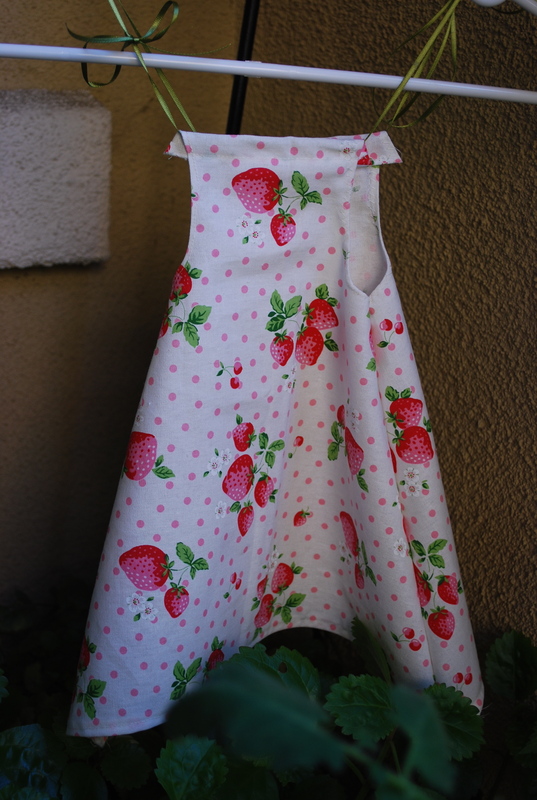 The first time I tried it, I used this adorable strawberry fabric I had been saving just for baby. I think my measurements were off quite a bit and without bias tape for the arm holes the dress came out a little lopsided and small in weird places. But I was determined to make a better dress and so a couple days later I tried it again with an old pillowcase I scooped up at an antique market. I think it came out pretty well. I still have a lot to learn about making clothes and I’m not even sure if either dress will fit her when she arrives. But, I’m glad I have begun this journey to making more than just scrap quilts. I’m following patterns and learning by doing… I hope to be learning and doing a whole lot more soon. It’s August and I thought I would do a quick garden journal before baby comes and the garden gets neglected. Although I’m hoping to add that to the list of “things visitors can do to help” – water the garden. 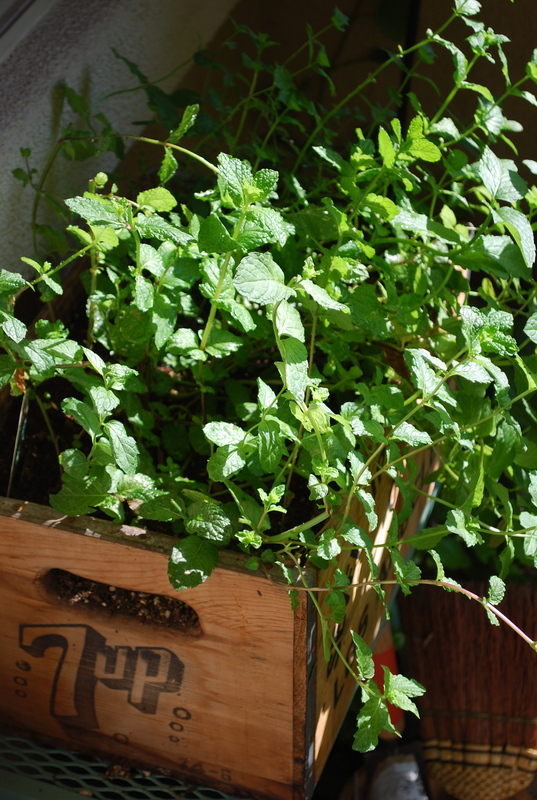 The mint is steadily growing. Caterpillars are seen here and there but they are getting harder to spot and catch because of the thick growth. I was worried we were going to lose the Home Depot Tomato. 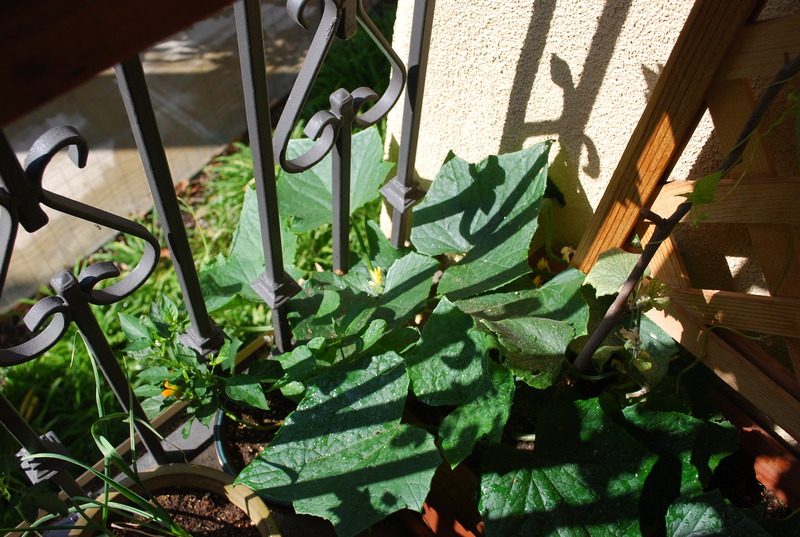 It was getting yellowish leaves and white spots on it and every day I was cutting it down to a smaller and smaller plant. 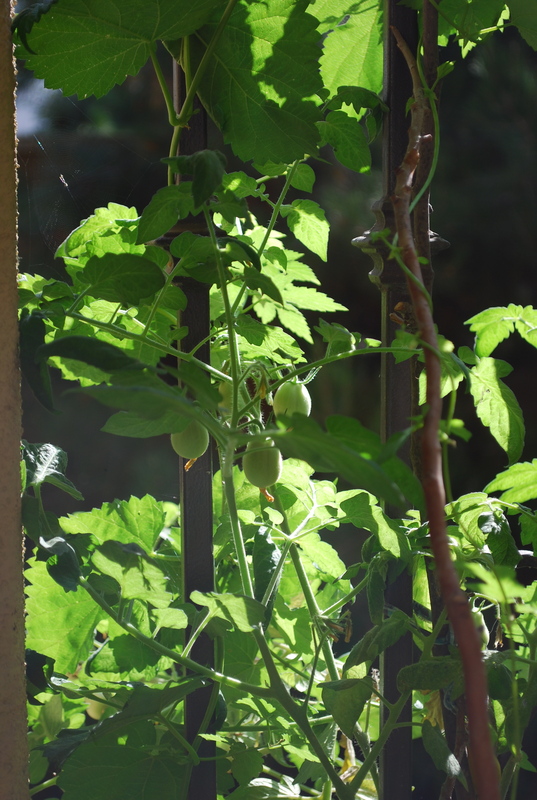 But, I think I may have saved it and now it has tomatoes galore, growing steadily. The Hop plant is winding in and out of it’s trellis sticks and I’m wondering if the tomato is enjoying the company? 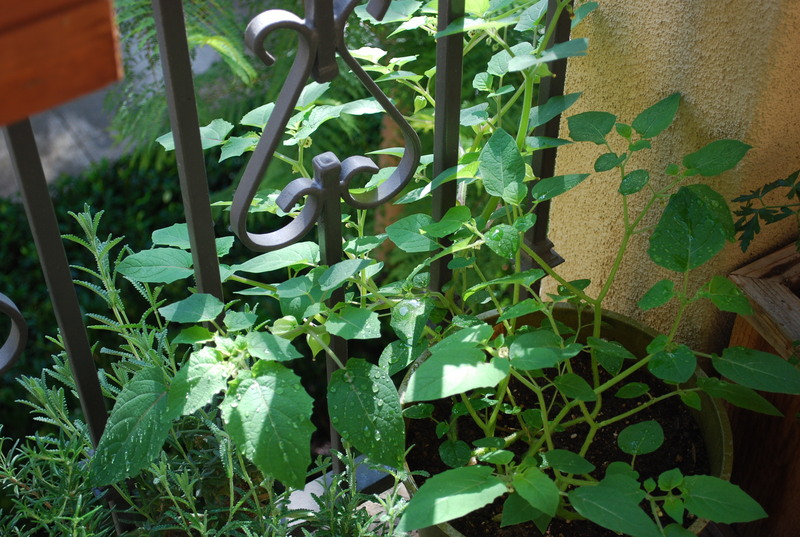 Another one of our saves, the ground cherry. I planted this from seed and it was so puny for so long, I didn’t have much faith in it growing. Then when it did grow, we found rust or mites on half of the plant. I cut the whole plant back to only a few green leaves and waited to see what happened. It grew back fantastically. No more mites or rust and you can see there are ground cherry husks finally growing too. 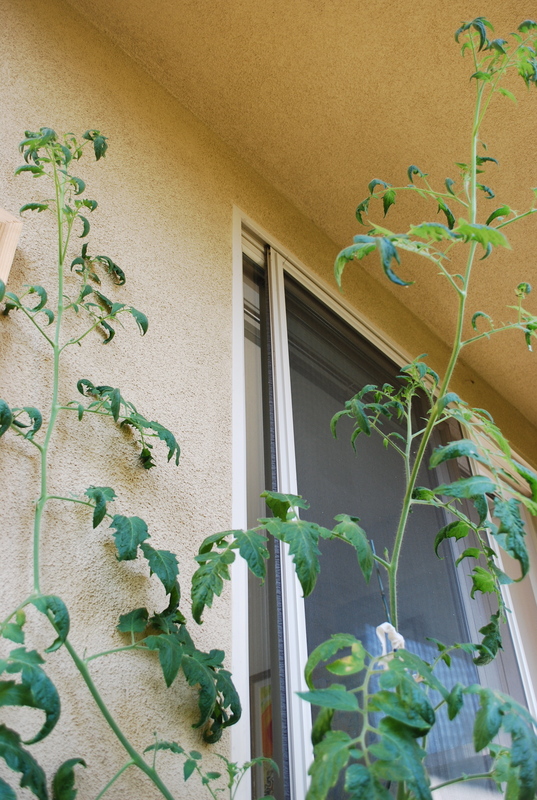 Here is our largest tomato plant which we did not do a great job at staking. It’s just getting so large, its like a tomato tree! It hasn’t produced anything for us yet and I don’t think it will. I had two of them and one of them completely died off. As you can see this plant also has some patchy yellowish brown on it. I will try to stake it better before baby comes and maybe that will help. I think it may just be too large of a plant for a tiny balcony. The cucumbers have gone rogue. Last year I trellised them up some sticks and it worked fantastically. This year they wanted nothing to do with the fancy store bought trellis and have branched out over their trough and are working their way down and out over our balcony. I’m waiting for my neighbor to come knock on our door with all of our bounty of cucumbers and tomatoes, since that’s where most it looks like it’s going to end up. To the left of the cucumbers, I’m still waiting for that little mini pepper to turn yellow. It’s almost there and I think that may be the one pepper we get from that plant this year. 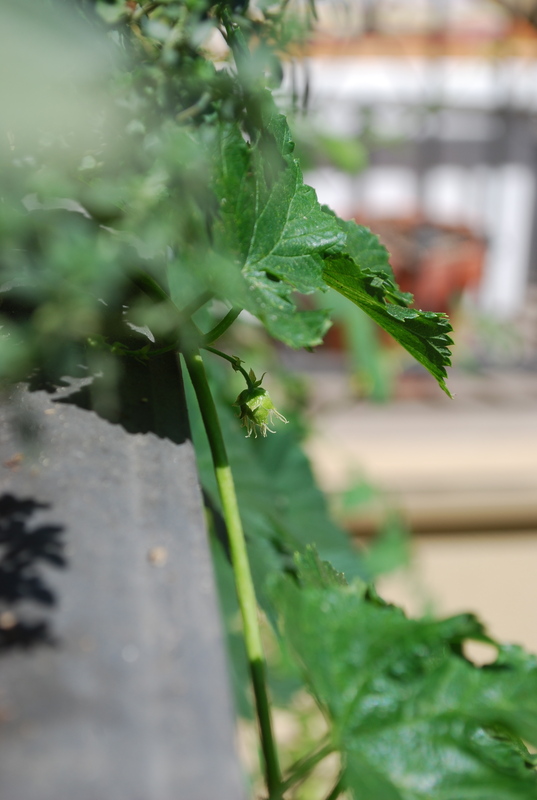 And my husband wanted me to include his pride and joy- the flowering of his hop plant. This will turn into a hop cone which will then be collected and dried for use in his home brewed beer. Very cool! These plants are crazy growers and sprawlers. 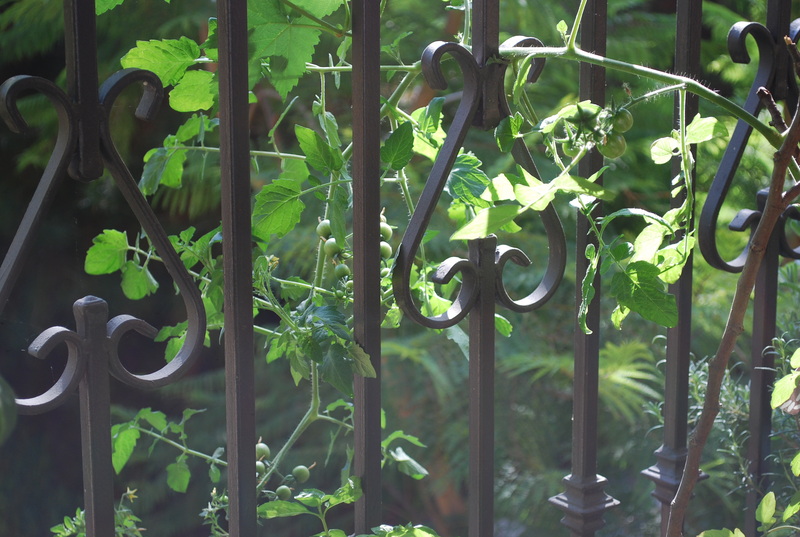 The balcony railings are covered in hops, its lovely but I’m thinking we’re going to need to move soon before the hops take over the building and we get kicked out. It’s finally August and I am 3 days away from my due date! 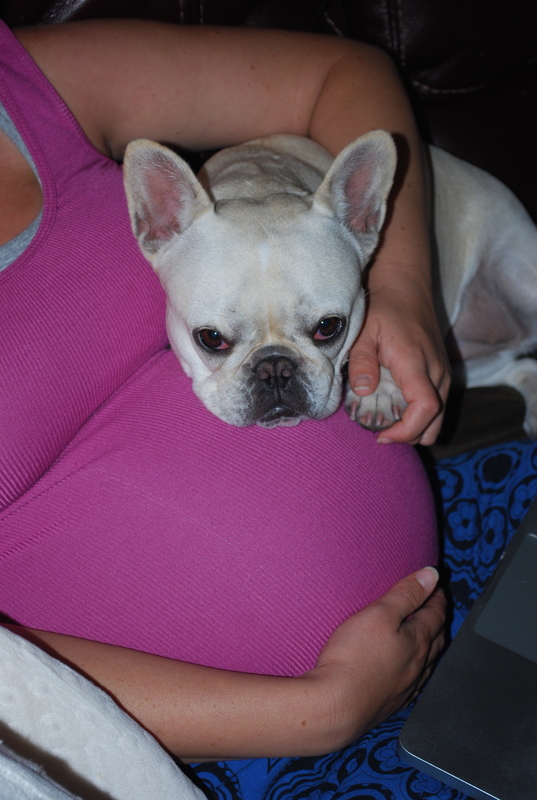 And boy am I anxious, excited and ready for baby to arrive. ( I love Nikki McClure’s August calendar. 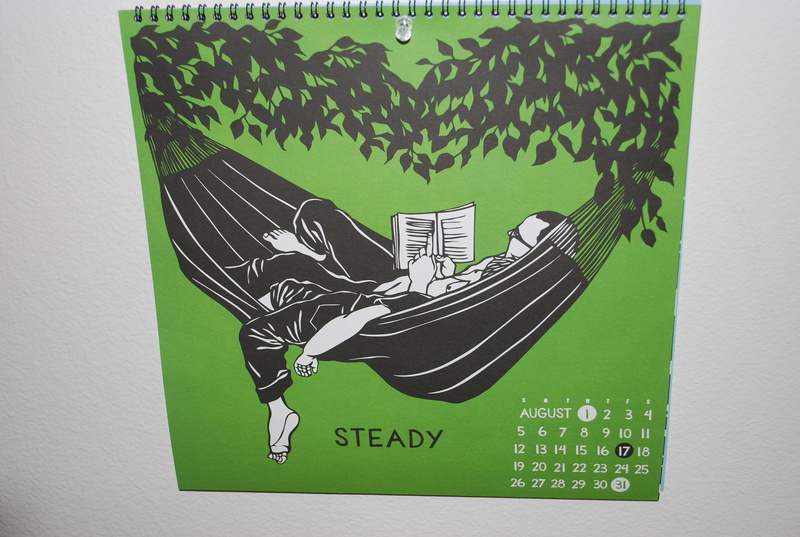 Steady is a great word for me to remember this month). 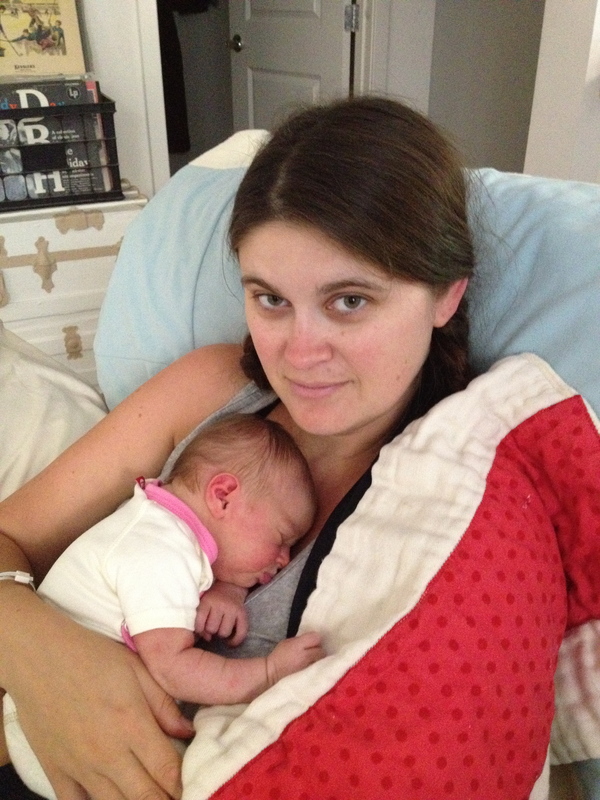 It’s been difficult for me to rest even with all the end of pregnancy aches and pains. I want everything to be ready, I want to get in as much project work as I can get done before baby comes and in between all the cleaning, making and preparing, I have had the worst sugar cravings that have kept my oven and ice cream maker very busy. 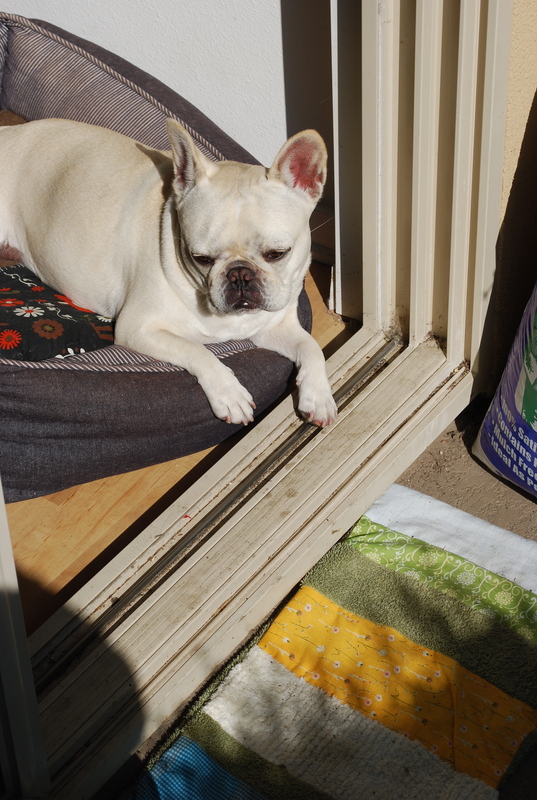 I was on a roll sewing things after finishing that garden mat. 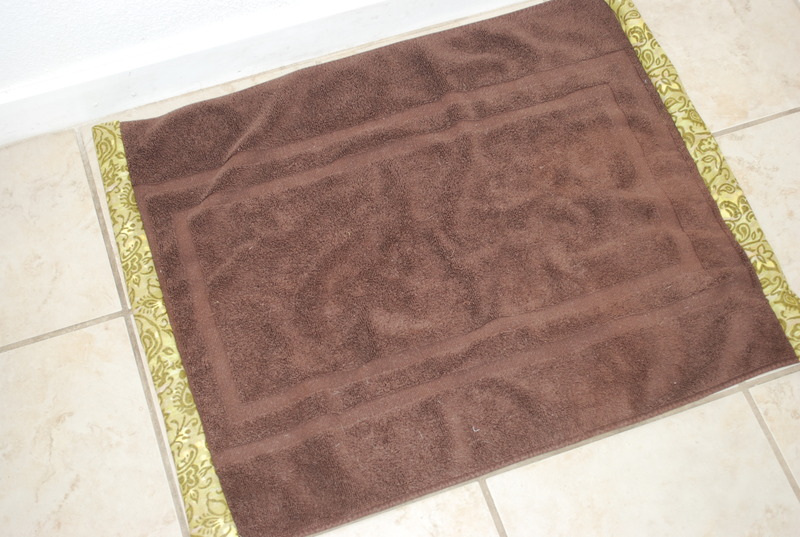 I went ahead and fixed up our bathroom mat which had been partially chewed by our shepherd mix over a year ago. It was something I had always wanted to get done but never found time for. Well, with all this nesting, I decided that was something we should have in our apartment- a bath mat. It’s nothing too fancy but I cut off the chewed up ends and added some lovely green fabric to the mat and voila! we finally have a mat again. With baby coming in a matter of days, I have been reading and you tubing up on what a cloth diaper stash should look like and making sure I know how to use cloth diapers before baby comes. We are planning on using them exclusively from the beginning, and like every thing baby related, I have been wanting to know EVERYTHING! The cloth diaper thing has already become an obsession even though our whole stash and everything we need has already been given to us by wonderful relatives and friends. 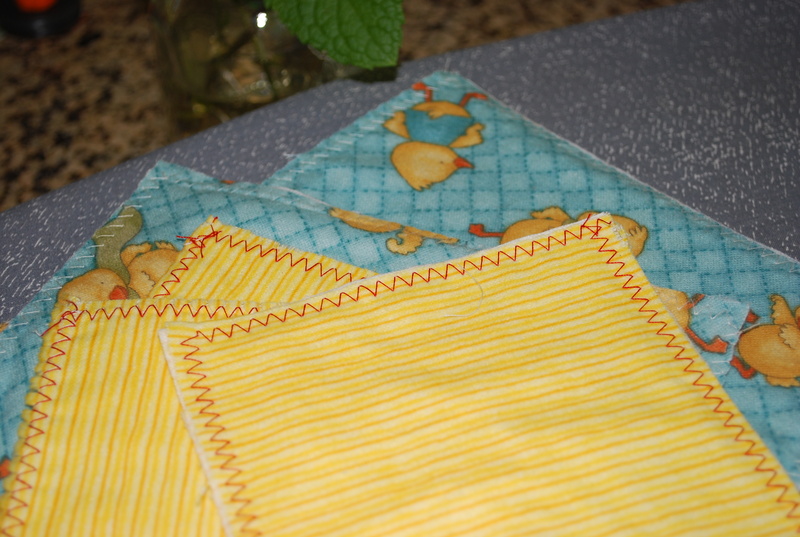 I think I will have to do a whole post on cloth diapering a little later. It makes me excited just thinking about writing a post about it! I know the little things that are making me giddy these days. I think I am really turning into a mom. Anyway, since we are planning on embarking on the cloth diapering adventure, I thought we may as well go all out and get cloth wipes as well. I bought some on Etsy a few weeks back but then after seeing other parents you tube videos about their cloth diapering experiences, I realized I should just make wipes. After all, one of the biggest reasons why we are using cloth is to save money and what better way to save then to make it yourself, with what you have. So I put a few of them together with some old flannel I had. 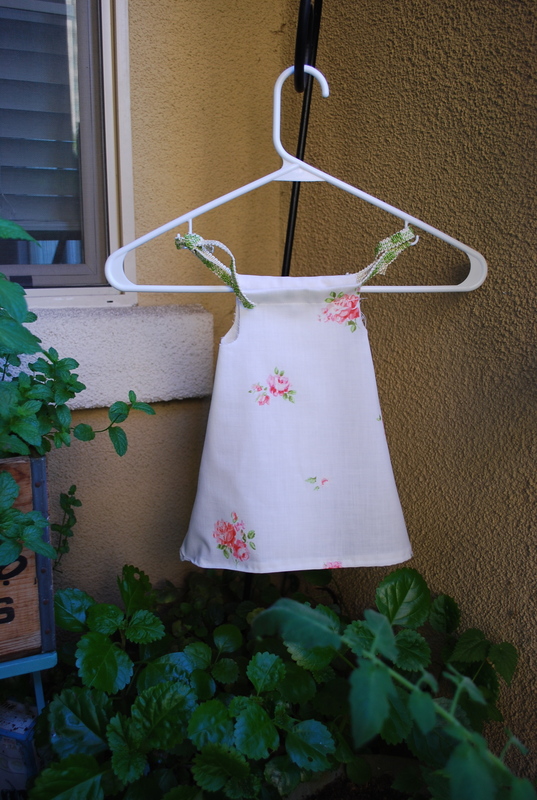 I even got adventurous and tried my hand at a baby girl dress. That one didn’t turn out so well, but it was exciting putting it together. I think I may try it again. I loved that my mom and grandmothers made some of our clothes as kids and I would love to do that for my own baby. I will share that one a little later on as well. With the end of my ninth month has come a sweet tooth I cannot escape. I have been baking A LOT. Today I wanted to share with you a recipe I felt was posted just for me! I have a ton of frozen banana’s in the fridge and have been meaning to put together some banana breads with them. 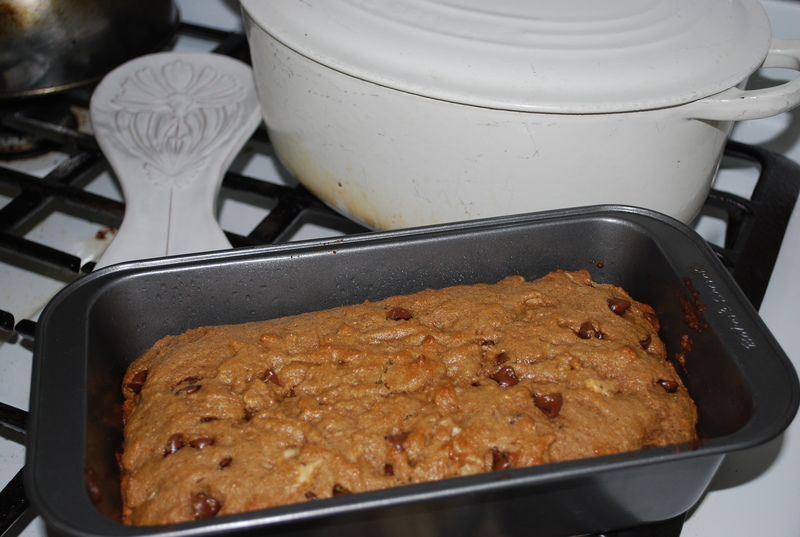 unfortunately, banana bread seems to be lacking the sugar I have been craving- until this recipe popped up. Thank you Joy the baker!!! I’ve never made anything in a skillet before but it looked easy enough. It actually one of the easiest bread/cookies I’ve ever made. 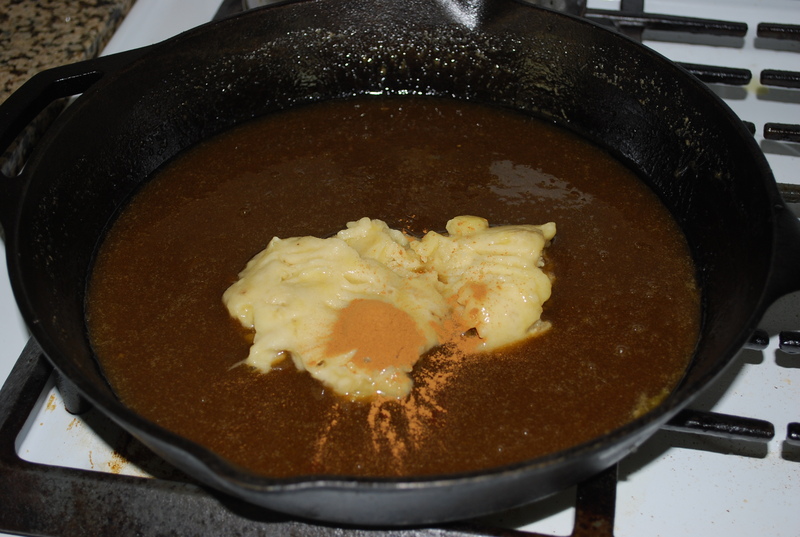 However, I realized a little late my skillet was a little too large and the batter would have burned if I cooked it in the skillet. So I transferred the mixture into a loaf pan and it baked up beautifully! I used whole wheat flour instead of all purpose and added another banana as well (because I have so many in that fridge). It is far more cookie than bread- let me tell you! 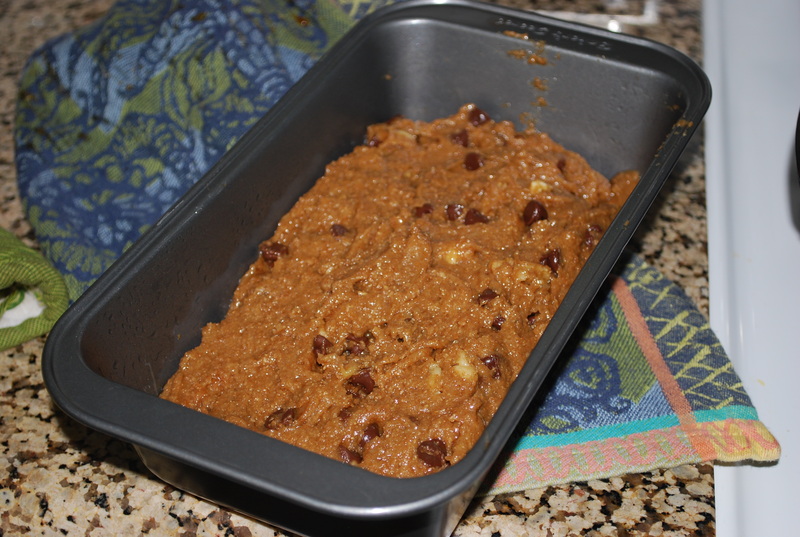 Even in the loaf pan, its gooey and delicious and would be perfect warm with homemade ice cream. Which I think is precisely what I am going to do right now- my afternoon snack. Come on, it has banana’s and walnuts in it- those are good for me!